Successfully Added Portable DVB-T Tuner + All-In-One Media Player to your Shopping Cart. 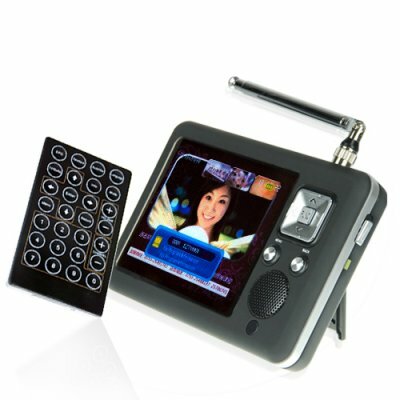 Portable media player with DVB-T and polarized 3.5 inch screen. The perfect device for the TV addict on the go, this handheld DTV-T tuner is great for catching the live game, or watching you favorite TV shows when you're away from home. And you will find that the digital TV signal comes through much more clearly than you ever saw with old style analog TV. Having native support for a variety of media codecs and reading from SD and USB flash devices, you'll have plenty of digital media choices to enjoy such as MP4 videos, MP3 music, and JPEG pictures files when you are not watching TV. This all-in-one multimedia player is a real powerhouse, and you are going to love the portable size yet beautiful picture quality you get with the 3.5" screen. Available right now from the home of direct from China wholesale electronics, Chinavasion. Want an easy way to install DVB-T in your car? This 3.5" DVB-T model is a great solution!